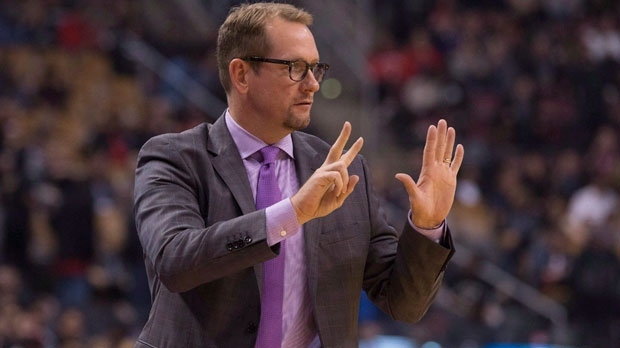 TORONTO -- Nick Nurse's plan for his debut as an NBA head coach included his sleep pattern. The 51-year-old deliberately got up early for a 5:30 morning workout Tuesday, hoping it would make sleep easier on the eve of the Toronto Raptors' season-opener Wednesday night against Cleveland. "I laid down pretty early (Tuesday) night and I was starting to go through some plays in my head while I was laying there in bed. I'm not sure I made it through one," he recalled with a laugh. "I fell asleep pretty quickly." Score one for Nurse, who spent five years as a Raptors assistant before succeeding the fired Dwane Casey as head coach in June. "I said it when I got hired, I said for five years I had a 1,000 people telling me I was going to be a head coach in the NBA. And when I got the job, those same 1,000 people were shocked," Nurse said, drawing laughs. "And those same 1,000 people are really nervous tonight." As luck would have it, his regular-season debut at the helm came against the Cavaliers, the Raptors' boogeyman. Cleveland swept the Raptors the last two playoffs. Nurse fitted in another workout plus a nap at home Wednesday afternoon. "It's certainly a pretty cool thing," he said of the head coaching gig. "But again I hope it's kind of just the beginning, so I don't want to sit here and make this too big a deal." He said the season opener was a time "to be thankful for the journey." "I don't think when I decided I didn't want to be an accountant any more that I was necessarily saying I wanted to be an NBA head coach. I just really wanted to figure out if I could do it." Nurse's path to NBA head coach took him from the college ranks to the British Basketball League and NBA G League. A native of Carroll, Iowa, he played collegiate basketball at Northern Iowa and stayed on as an assistant coach during the 1989-90 season. He said he changed career goals during his junior year, knowing he wasn't going to play in the NBA. "I went to talk to my coach at the time, Eldon Miller, and said I'm going to finish up my degree, I think I'm close enough to do it but I think I want to start coaching and see where that leads me. And he said 'Sure. Come on join the staff as an assistant.' There we go." After getting the Raptors head coaching job, Miller was one of the people he visited. It was his last stop, right before training camp. After arriving in Traverse City, Mich., Nurse said he got some terrific advice within a minute of being picked up by Miller. "He said "You want to know what it's all about?' ... And I said 'What's that Coach?'" Nurse related. "And he said 'Playing to win without fear.' And that was kind of the end of the conversation as we drove in silence. Pretty good one." After Northern Iowa, Nurse went on to spend one season as player-coach of the Derby Storm in England before becoming head coach at Grand View College in Iowa. "I think I jumped the gun a bit on head coaching," he said. "I got named a head coach at 23 and I really didn't know what I was doing. I remember getting that job and going 'Oh my God, they gave me the job,"' he said with a laugh. He called Miller and his high school coach for help. "They were sending me books and tapes. You think you're ready but you really aren't at that age," he said. After two seasons at Grand View College, he returned to England where he coached the Birmingham Bullets (1995-96), Manchester Giants (1998-2000), London Towers (2000-01) and Brighton Bears (2000-06). He won British titles in 1996 and 2000, and was named coach of the year in 2000 and 2003. Prior to joining the Raptors, Nurse enjoyed six successful seasons in the NBA G League as head coach of the Iowa Energy (2007-11) and Rio Grande Valley Vipers (2011-13). He is the only coach to lead two different teams to an NBA G League Championship. Nurse also served as an assistant coach for Britain at the 2012 Olympics.